Lilly of the West is working on the finishing touches of the new album Swings & heartaches. The release is scheduled for January 2012. Special guest on the album is Slovak mandolin virtuoso Michal Barok (29 Strings, Meantime). Here is a preview of the cover; more news to come on my website. Swings & heartaches includes eleven songs, in two parts. The 'swings' are lively, up-tempo songs from the 1940s/'50s, featuring two Patsy Cline hits ('Gotta lotta rhythm in my soul' and 'Walkin’ after midnight'), one by Hank Williams ('Lovesick blues'), two old Western Swing standards ('My window faces the south', 'I’m gonna sit right down and write myself a letter'), and a modern swing ('Who knows what tomorrow may bring'). The 'heartaches' are beautiful ballads with strong lyrics. One is a Johnny Cash/June Carter duet ('If I were a carpenter'), another is an Everly Brothers’ classic ('Crying in the rain'); a modern nostalgic song by Jools Holland and Sam Brown ('Valentine moon'), and two Bulgarian folk melodies ('Brala moma' and 'Malka moma'). 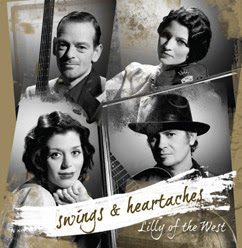 On 11.11.2001 Lilly of the West performed together with American bluegrass and old-time dance band Mountain Quickstep. The concert took place in the Studio 5 club, Sofia, and was organized by the cultural department of the US embassy. Mountain Quickstep is currently on tour in Moldova, Macedonia, and Kosovo. Videos, photos, and a full diary of Mountain Quickstep's tour can be seen on the band's website. Front Page Bluegrass News comes to Ireland!